The Control Panel for a Vostok (left) sits beside an Instrument panel (Right). This Instrument Panel minus the Signal Table markings appeared at the Institute of Economic Acheivements in Moscow in 1967. Oddly, the middle three part gauge has "Radiation" as a parameter. This page examines the Control and Display system of the Spacecraft “Vostok” Космического Корабля «Восток» as flown from April 12, 1961 to June 19, 1963 on six human piloted missions. The displays and controls of the Spacecraft “Vostok” were mostly located on two panels in the spacecraft. There are two main panels of the spacecraft "Vostok" are known as the System of Indication and Signalization-1-3KA (СИС-1-3КА - система 1 индикации и сигнализации). Here 3КА or 3А* was the internal designation for the human rated Vostok. The black panel on the left side of the cabin (and the left in the above picture) is known as the Control Panel (ПУ - Пульт управления) and the panel in the upper center of the cabin (right side of the picture) is known as the Instrument Panel (ПД - приборная доска). In addition there is a controller for manual orientation (РУ - ручка управления) or attitude control and several other controls not in this picture that are part of the overall system in the Right Side Controls (See Below). 1) Directly by the Cosmonaut. 2) By Automatic Timer Mechanisms such the Program-Timer-Unit “Granite” and barometrically initiated relays, environmental system relays, and an analog computer for solar guided orientation. 3) By Command Radio Link (Командная Радиолиния «МРВ-ВС – БКРЛ-В») as initiated by ground stations. See the first section under the Ground Support tab. Here, we shall focus on the first way. In general, the cosmonaut had control over voice communications and tape recorder (Магнитофон), manual orientation and the associated optical device “Vzor” ВЗОР, the globe display, emergency retrofire, nominal and contingency ejection initiations, cabin lighting, circulation fan, and emergency oxygen. The majority of these controls were on the control panel on the left side of the cabin. Right Hand Side Controls:It is notable there was a short wave broadcast radio receiver in the cabin a 3B-17 *radio receiver (ЗБ-17 широковещательный радиоприемник –ШВРП) built by the Moscow Radio Institute (НИИ-695 МНИИРС) as a component of the Zarya (Заря) radio system. 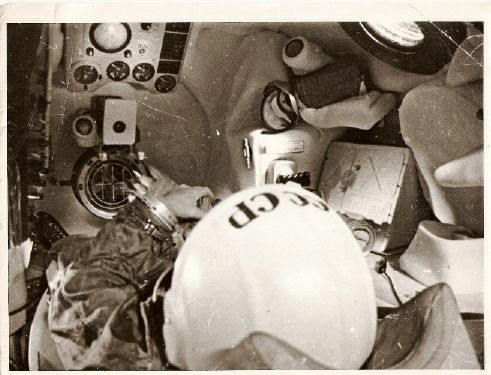 Just above the radio is a large circuit breaker was for arming the ejection seat catapult a.k.a the “armchair” (кресло пилота КП-В-ЗА) labeled Permission Catapult or Ejection (РАЗРЕШЕНИЕ КАТАП.) and End or Shutdown the Catapult or Ejection (ОТБОЙ КАТАПУЛТЬТИР.) Oddly, this breaker is not currently in Yuri Gagarin's Vostok-1 at the Energia Museum. To the right of the radio and orientation controller were depending on the spacecraft, 2 or 3 **additional circuit levers speculated to turn on and off rotation on three individual axis (Roll, Pitch, Yaw)or alternatively opening and closing valves of nitrogen gas for the orientation system (notice the crossfeeds on the attitude control system scheme under this Tab). Additional controls for experiments could be placed in this area. On Vostok-5 a switch to activate a Spectrometer (СПЕКТРОМЕТР) and an enigmatic S-08 (С-08) switch were placed. An Achs-1 (АЧС-1) standard aircraft clock and a telegraph key completed this section. *This radio, interestingly was powered by a small radioisotope battery. Cosmonauts did indeed listen to AM broadcasts from around the world during the flight. There were three bands that were listened to. (1) K2 - 24 Meters to 28 Meters including the 25 Meter International Broadcast Band (11650 to 12050 kHz) (2) 28 Meters to 50 Meters including the 31 Meter Band (9500 to 9900 kHz) the 41 Meter Band (7100 to 7300 kHz) and finally the 49 Meter Band (5950-6200 kHz). (3) The C Band (Средние волны) from 187-571 Meters - Medium wave. For example, Moscow's Radio Mayak (Маяк) was at 546 Meters or 549 kHz. Interestingly, the 24, 31, 39, and 50 Meter areas are marked for reference on Vostok-5. **On Yuri Gagarin’s Vostok only two axis were available for manual control – pitch and yaw. Roll was of a lower priority as it does not affect the trajectory of retrofire. Displays and Indicators: With regard to indication we have 25 signal lights, 3 gauges each with 3 dial indicators (one dial on one gauge could display two states – so 10 indications total), a clockwork globe, and two clocks, one of which had a special system of indication for the automated descent program progression. The gauges displayed environmental conditions of the cabin and pressures of the attitude system tanks and retrorocket. The majority of the displays were located on the instrument panel. The Instrument Panel: DWG # 669-7500-0. The dimensions of the instrument panel are approximately 40 cm wide and 38 cm tall. The Globe Device on the Instrument Panel measures 23.4cm wide by 20.4cm tall. The installation of instrument panel is mounted in the cabin above the illuminator of optical orientation device “Vzor” at a distance not more than 1OOO mm reach of pilot. The front face of the instrument panel must be established at the angle of 45 degrees. 1. Globe Device - IMP (глобус) more formally known as the Indicator of Place in Flight or Place of Landing (ИМП-индикатор места положения и местапосадки). It is notable here that the Latitude/Longitude indicator sometimes pictured above the Globe was not present on flights of the “Vostok”, but was used on the flights of the spacecraft "Voshod" (Восход). Two switches on the control panel on the left control this device - one is the on/off function, the other switches the device between displaying the place in flight and the place of landing. When the place in flight is selected a green light above the globe labeled "Place in Flight" (МЕСТАПОЛОЖЕНИЯ) is illuminated in green. Two adjustment knobs below the globe labeled O and Ae (О, Э) changed the position of the globe. Ae changed the position in the equatorial plane and O changed the position within the orbital plane., a three digit orbit counter in the lower right section of the globe section labeled «ЧИСЛО ВИТКОВ» and a correction index display and adjustment knob completed this stand-alone portion of the instrument panel. The correction (КОРРЕКЦИЯ) knob consists of two parts. The upper part switches between three states Center, Right, and Left (С-средиий П-правый Л-левый). When C was selected center digit was changed, P the Right digit and L the left digit. The lower part of the knob changes the direction of the numbered wheels’ rotation (НАПРАВЛЕНИЕ ВРАЩЕНИЯ) and adjusts smaller numbers (МЕНЬШЕ) corrections clockwise and larger number (БОЛЬШЕ) corrections counter clockwise. The three digit window for the correction index sits above this two part knob. This Globe device was built by OT or GKOT. There are four versions known: It is important to note that Vostok though Vostok-6 had either the IMP-1 or IMP-2 type globes during flight. Numerous labels have shown apparently surplus IMP-3 and IMP-4 Globus devices mounted in various instrument panels and presented as “Vostok”. IMP-1 (ИМП-1) (No Orbit Counter) IMP-2 (ИМП-2) Vostok-2 through 6 Flight Version (No Latitude/Longitude Indicator) IMP-3 (ИМП-3) with Latitude/Longitude Indicator, IMP-4 (ИМП-4) Voskhod Version (Variation to knob style and warning added to Orbit Counter Mechanism) This Globe device was powered by a small electric motor. With the exception of several diodes and the status indicator light, it was completely a mechanical device. 2. Combined Time Indicator - (ИВК - индикатор временной комбинированный) or clock (at a glance looks like a gauge at the lower left of the instrument panel). This device is connected with Working Control of the Descent Regime (ПКРС — прибор контроля режима спуска) that controls the sequence of spacecraft functions prior to retrofire. There are two known types of this indicator readily distinguished by the number of adjustment knobs on the outside rim of this timepiece and the presence an additional secondhand at the 12:00 position. IVK-1 (ИВК-1) which flew on spacecraft Vostok-1 and 2 (and possibly 3 and 4) had two adjustments - one at 3:00 and one at 6:00. The later version (ИВК-2) had three adjustments and the additional secondhand and flew on Vostok-5, Vostok-6, and Voskhod. On the IVK-1 the Descent phase was marked on the rim as well as "I" at 0 minutes, "II" at 6 and a half minutes and "III" at 37 minutes with additional markings at 39, 44, and 51 minutes. These markings were related directly to events displayed in green on the signal table (Табло сигнальные). The IVK was manufactured by the same design bureau that produced the IMP Globe Device - “ОТ”. 3. Cabin Temperature (ДТВ - датчики температуры воздуха) (0-40 Degrees Celsius) The last was unmarked for normal limits, but low temperatures below 12 C were considered problematic for the storage batteries or accumulator batteries. Gauge 3: Indicator of Pressure in Tanks of Orientation System and Retrorocket. (ИДБ - Индикатор Давления в Баллонах систем ориентации и ТДУ). 3. Automatic Attitude Control System Pressures (0-200 Atmospheres with 50-150 Atmospheres considered to be a normal range.) This portion of the gauge changes display between Automatic System I and Automatic System II based on the position of the switch on the control panel. 4. Signal Table (Табло сигнальные) For a complete and illustration look under the Signal Table Page Tab. The large green signal light above the globe device was labeled "Place of Landing" (МЕСТО ПОСАДКИ). Do not let the rare photo with Place of Flight (МЕСТО ПОЛОЖЕНИЯ) mislead you as this was but one display and official documentation verifies МЕСТО ПОСАДКИ was indeed the correct notation. This would save power on a mission as well as the globe mode was normally for Place of Flight during the mission. Manual Control Handle. (РУ - ручка управления) DWG # 12-480-13. The Manual Control Handle set at the Cosmonaut's right hand side. Up/Down movement of this handle controls pitch, Left/Right Movement controls yaw, and twisting the handle clockwise or counterclockwise produces roll. Where are the Instrument Panels (PD - 3K) today?